The Copystar CS-1810 is a multifunction copier that has decent capabilities for printing, copying with an added optional network printing function. The Copystar CS-1810 looks to provide an alternative to the more popular multifunction printers available in the market today, with its affordability and functionality. With a network capability added as an improvement to its predecessor, the Copystar CS-1510, the Copystar CS-1810 easily suits small offices and business that place a premium on getting the best value for their money when it comes to their office needs. The CS-1810 has a decent print speed for a multifunction copier, able to produce 18 pages per minute for letter types and 15 ppm for legal. Output warm-up speed is also relatively remarkable for a small workgroup multifunction machine with only 30 seconds needed to have the printer running. First copy out is as impressive, with approximately 6.3 seconds. Resolution is also not bad, with a 600 x 600 dots per inch with halftones at 256 levels. The CS-1810 also has a full size and presets for reduction and enlargement, with a 50-200% zoom capacity. It also has a multiple/continuous copy function up to 99 pages, with other additional features such as auto magnification, scan once print many, electronic sort and Eco mode, for power saving. 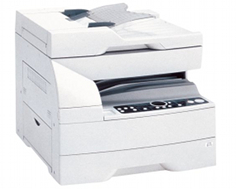 The CS-1810 adds an optional network printing to its copier functions, with an embedded PowerPC 405, 200 MHz controller. Printer memory is at a standard 8MB, but can be upgraded to 136MB to equip the CS-1810 in handling heavier printing. Operating system compatibility is a plus, as the CS-1810 is compatible to Windows, Mac and Linux-based systems. For its network printing function, CS-1810 uses a standard parallel IEEE1284 with optional expansion slots for 10/100 Base TX and wireless connectivity. The CS-1810 also boasts a 30-sheet automatic document feeder, an improvement from its predecessor. Paper tray comes in at a standard 250-sheet capacity, with a multi-purpose tray handling 50 sheets for thicker media such as transparencies, envelopes and labels. 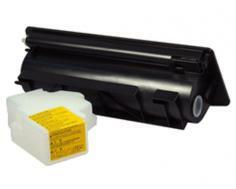 The CS-1810 has a maximum capacity of 550 sheets for paper handling, and 17-21 lbs. for handling paper weight in its drawers. The CS-1810 also has a maximum paper size handling at 5.5" x 8.5" to 8.5" x 14". In addition, the CS-1810 also has adjustable exposure controls for producing quality copies of photos, text and graphics. The exposure controls are automatic photo, text, mixed and economic modes. For a copier marketed as a multiple function device, the CS-1810 fares rather disappointingly compared to other multifunction systems from other manufacturer brands. While other multifunction devices offer printing or network printing as a standard function, the CS-1810 only has network printing optional, with the function being sold separately. This is a critical function in the market for multifunction devices, with most having fax option as its optional feature, not printing or network printing. Also, though able to produce decent speeds in copying and printing, the CS-1810 is slower compared to other multifunction printers with 20-23 ppm speeds. Although one may find this downside minimal, speeds in copying and printing often determine a multifunction system's marketability, as most offices and businesses look for faster and more efficient printers/copiers to boost their productivity. 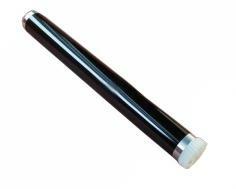 Another caveat is its bulky size. For a relatively limited multifunction system, the CS-1810 is hefty, with dimensions at 20" x 20" x 18" for its width, depth and height, and a heavy 59 lbs. Though small enough for a limited office space, the CS-1810 can be hard to move around and certainly not ideal size-wise for workplaces with limited space. Review it: "Copystar CS-1810 "
The CS-1810 has a yield of 100,000 pages for each its drum and developer units, with the toner cartridge offered separately. Its maximum monthly cycle is at 15,000 pages with a recommended 500 to 3,000 pages per month, which are similar to that of standard copiers and printers. Toner cartridges, though sold separately are affordable, and are sure to increase productivity and maximize the CS-1810's usage and functionality.